There is some truth to that, but in the end it's a flawed analysis. It's an analysis that assumes there is some easy answer to the Brexit mess, that the politicians by mere stupidity or deviousness are ignoring, when in fact there isn't. This is an intractable problem, caused by a crazy selfish decision to hold the election, but also by the votes cast by all those people who voted Leave, which is going to go on for years and years. There are some idiots in parliament, but I reject the notion that this generation of politicians are uniquely terrible compared to previous generations. Of politicians being terrible compared to previous generations - it’s about how they have collectively acted at this defining period . The greater good of the country or 'the national interest' is a bit of a pet hate of mine, I'm afraid. I just think it's based on a false assumption that there is such a thing. There are competing groups of people, some in politics and most outside politics, with their own particular interests, most of them to do with class or material gain, and some of whom will even benefit from mad things like a No Deal Brexit. There is indeed that complexity..handling multi and competing agendas is what leadership needs to do at times of crisis...that is precisely why we should have had a set of Political Leaders standing above those partisan agendas on all sides. when historians judge this period - it will be seen as a time when the Tories put staying in power above the right thing for the country , and Labour put seeking to get into power above the right thing for the country ..
At a time when we need Leadership the most , we are leaderless..
May is coming to the end of her time in the limelight and is desperate not to go down in historee as the leaderene who caused the Tory party to break up. That's the sole reason she is listening to the likes of Mark Ffsfrancois rather than telling him to GTF. ha Ha I take your point. This is the greatest country in the world. It must be. Otherwise why would folk be risking their lives clinging on to the under sides of lorries to get here? Go figure (as they say in America). Check the figures. Turkey has the largest number of asylum seekers in Europe. Also you should watch Glasgow Girls for an excellent view on asylum seekers in the UK. Because the EU gave Turkey 6 billion euros to keep 'em there. Britain's definitely the best country. WATP. MBGA. BRTW. etc. We are not the only country people are trying to migrate to. All liberal democracies countries are experiencing this because it is the best system of government available. The amount of migrants we are dealing with are tiny compared to some countries. There are plenty of economic migrants in Saudi, the UAE etc. Follow the money. The whole of Germany is laughing themselves into a hysterical fit whilst simultaneously polishing all 4 World Cup trophies at this statement. In 2016 in Europe the UK was behind Luxembourg, Malta, Iceland, Cyprus, Ireland, Switzerland, Sweden, Leichtenstein, Austria, Denmark, Germany, Norway, Estonia, the Netherlands, Belgium and Greece in terms of proportion of immigrants per country. Clearly not that popular. Last edited by Diclonius; 12-02-2019 at 11:09 AM. Another will she, won't she? article (spoiler - no scoobies abound). Would the British PM really drive the UK over the cliff edge? (2) If it were, yes she would if it helped preserve the Tory party. The sound of leather on willow, warm beer, more tea vicar? Exactly. Clearly migrants would prefer to come here to England. The fact so many have ended up in Germany is testament to the way that the Germans are trying to dominate Europe and especially us. It's even worse than towels on deckchairs, because they're using innocent, vulnerable people to get one over on us. Had to stand up for that. Nobody else in the pub did, the disrespectful whippersnappers. Fixed the knot on my tie. Made sure the club cufflinks were secure. Full salute and maybe just the slightest hint of a tear in the corner of my eye. "...It's nothing matron, just blinking..."
Interesting poll at the bottom of the article. Aw, dinnae bring Nimrod into it, fantastic piece of music! Kick that can down the road Theresa. And get talking seriously with Labour. That’s a snobbish attitude and it’s why Leave won. Main parties ignore people who don’t normally vote (it’s why pensioners get free stuff no matter how loaded they are). This one should be on billboards all over Scotland, but sadly it won't be. Let's examine the facts, 55%voted no, so the suggestion is that we will remain a member of the EU. Now, jump forward 2 years and the rest of the UK (well England and Wales at least) voted to leave the EU, so voting NO results in us leaving the EU. Would a Yes vote have resulted in Scotland leaving the EU? not necessarily. Would a No vote have resulted in Scotland leaving the EU? As it transpires, definately. 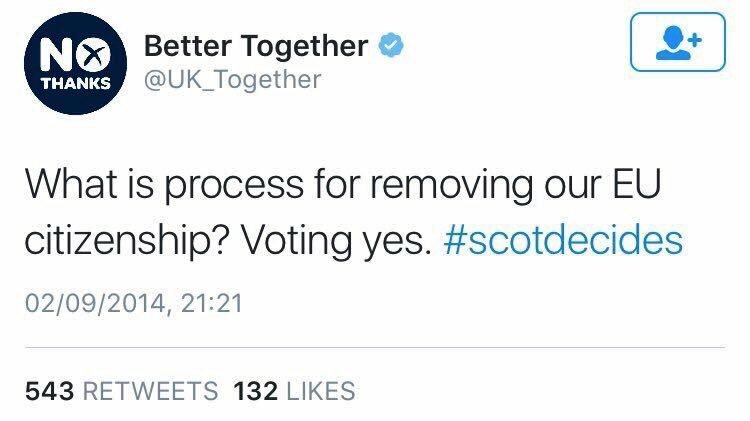 So how do you come up with the suggestion that a yes vote in 2014 has resulted in Scotland leaving the EU?